Also serving communities of Casco, West Paris, Fryeburg. There are 6 Assisted Living Facilities in the Auburn area, with 3 in Auburn and 3 nearby. The average cost of assisted living in Auburn is $4,650 per month. This is higher than the national median of $3,345. To help you with your search, browse the 14 reviews below for assisted living facilities in Auburn. On average, consumers rate assisted living in Auburn 4.3 out of 5 stars. Better rated regions include Falmouth with an average rating of 4.3 out of 5 stars. Caring.com has helped thousands of families find high-quality senior care. To speak with one of our Family Advisors about assisted living options and costs in Auburn, call (855) 863-8283. Auburn, Maine, is located in the southern portion of the state and has a total population of 23,033 people, and of these residents, 16.7 percent are age 65 or over. There are a total of six assisted living facilities in the Auburn area to help accommodate this population of seniors. Three are located within Auburn, and another three are located nearby in Lewiston and Lisbon. Auburn has relatively comfortable weather for spring, summer and fall, making outdoor activities fun for seniors. The average July high is around 79 degrees and there are an average of 199 sunny days a year. Winters in Auburn, however, tend to be a bit challenging, as is the case for much of New England. Auburn receives 71 inches of snow, on average, each year, which is about 5.9 feet. Auburn is one of the more affordable places to live in the United States and in Maine. On a cost of living index where 100 is the national average, Auburn is 92, which is well below the average for Maine at 105. Seniors are bound to find affordable living options in Auburn. Violent crime is relatively low in Auburn, so seniors can feel safe living here. On a scale of one to 100, with one being low crime and 100 high crime, Auburn sits at 11.4. This is below the national average of 31.1 and the state average of 15.7. Property crime, however, is much more common at 54.0. This is above both the national and state averages, which are 38.1 and 24.1, respectively. Seniors searching for assisted living communities in Auburn may want to ask about extra security measures in place to protect them from incidents of property crime. Auburn is a member of the AARP Network of Age-Friendly Communities, meaning that its elected leadership “has made the commitment to actively work toward making their town, city or county a great place for people of all ages,” according to the AARP. The Auburn area is home to world-class medical facilities, including St. Mary's Auburn Campus, in the event of medical emergencies or illness. Unfortunately, Maine is not considered to be a tax-friendly state for retirees. While the state does not tax Social Security income, it does tax every other form of retirement income, including 401ks, IRAs and pension funds at rates as high as 7.15 percent. Assisted Living costs in Auburn start around $4,650 per month on average, while the nationwide average cost of assisted living is $4,000 per month, according to the latest figures from Genworth’s Cost of Care Survey. 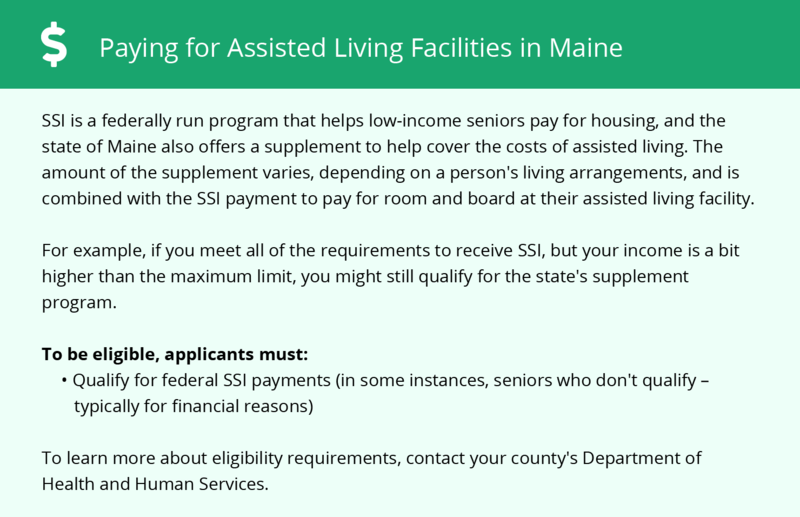 MaineCare, which is Maine's state name for Medicare, offers the Consumer Directed Attendant Services Program, which helps pay for personal care regardless of where the individual resides, including in an assisted living facility, and lets seniors choose their care providers. 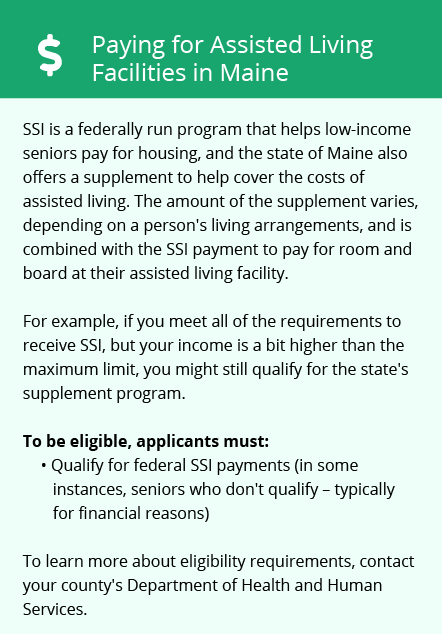 Learn more about these programs, plus who’s eligible, on our Assisted Living in Maine page. For more information about different ways to finance assisted living, visit our Assisted Living in Maine page. To see a list of free assisted living resources in Auburn, please visit our Assisted Living in Maine page. Auburn-area assisted living communities must adhere to the comprehensive set of state laws and regulations that all assisted living communities in Maine are required to follow. Visit our Assisted Living in Maine page for more information about these laws.